Carrig Dubh at Bannow Bay Cottages in Wellingtonbridge, near Wexford, County Wexford sleeps 5 people. Bannow Bay Cottages near Wexford are in a stunning setting overlooking Bannow Bay; these 200 year-old detached cottages offer a superb base from which to explore this beautiful part of Wexford. Each cottage has a private gravelled garden and enjoys sea views from most rooms. An Tigin (ref W32370 [An Tigin]) offers charming original features including a beamed ceiling and an exposed stone wall, whilst Carrig Dubh (ref W32369) boasts a very spacious living room with a cosy open fire. Just 100 yards from the cottages are the pebble shores of the estuary, with opportunities for sea bass fishing and bird watching (estuary and woodland birds). When the tide is out, twice daily, a lovely looped shoreline walk is to be enjoyed. This area has a great tradition of Irish music and dancing, and every year hosts the popular Phil Murphy Weekend. Nearby lies the ‘buried city’ of Bannow, where the Normans first landed in 1169. Other attractions within a short drive include Hook Lighthouse, Tintern Abbey and The John F Kennedy Arboretum. The on-site owners own a horse/pony trekking club and offer discounts to guests. The beach is 8 miles from Bannow Bay Cottages near Wexford. With the shop, pub and restaurant 3 miles from Bannow Bay Cottages. These properties can be booked together to sleep up to 9 people. Approximate distance to Cork airport is 172 km. Carrig Dubh has 2 steps to entrance. Kitchen/dining room: With LPG gas cooker, microwave, fridge, dishwasher and washing machine. Bedroom 1: With king-size bed, wooden floor and en-suite with shower cubicle and toilet. Bedroom 2: With 3 single beds, Velux window and wooden floor. Gas included. Initial fuel for open fire included. Travel cot and highchair available on request. Oil central heating and electricity by meter reading. Bed linen and towels included. Large gravelled garden with garden furniture. Gas barbecue (available on request). Private parking for 2 cars. No smoking. Please note: There is an unfenced estuary 200 yards away. Holidays at Carrig Dubh, Bannow Bay Cottages run from Saturday to Saturday. Pets allowed at Bannow Bay Cottages - Carrig Dubh. For a better idea of where Bannow Bay Cottages - Carrig Dubh is, you can see Bannow Bay Cottages - Carrig Dubh on the map below. 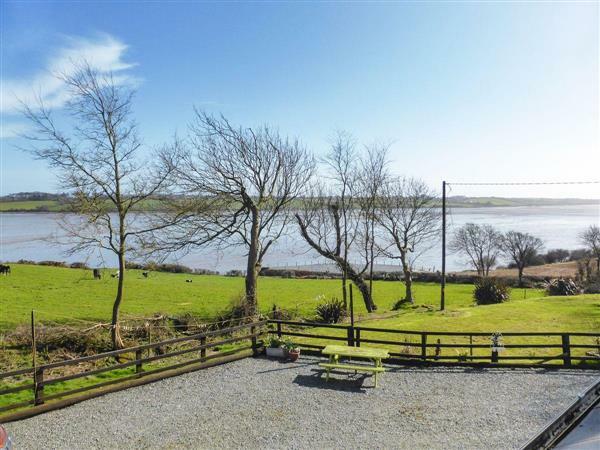 Do you want to holiday near Bannow Bay Cottages - Carrig Dubh (W32369), you can see other cottages within 25 miles of Bannow Bay Cottages - Carrig Dubh; have a look to find your perfect holiday location.